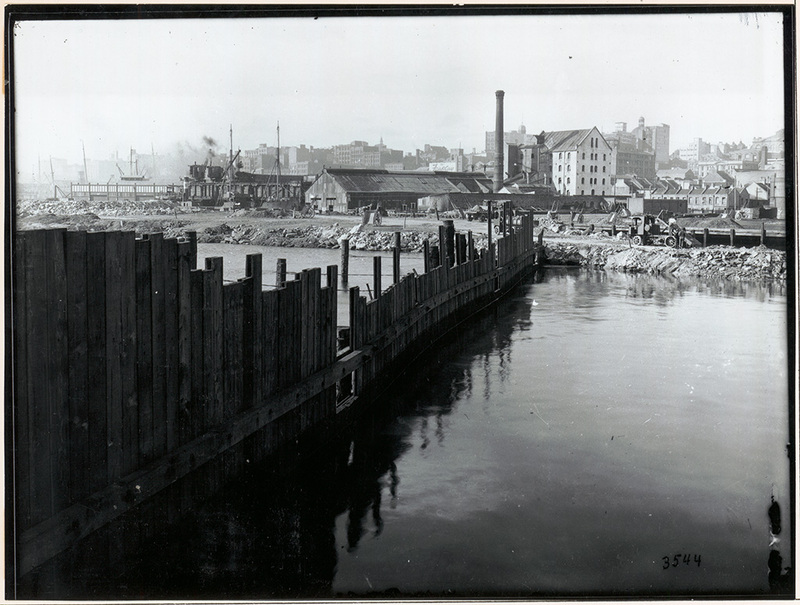 This gallery highlights the transformation of Darling Harbour. 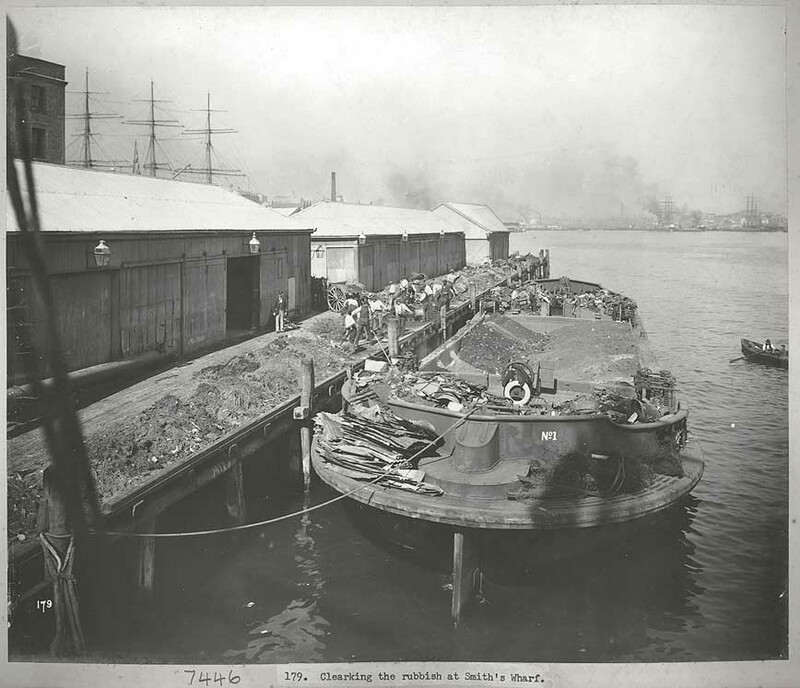 For many years Darling Harbour was the working port for Sydney. 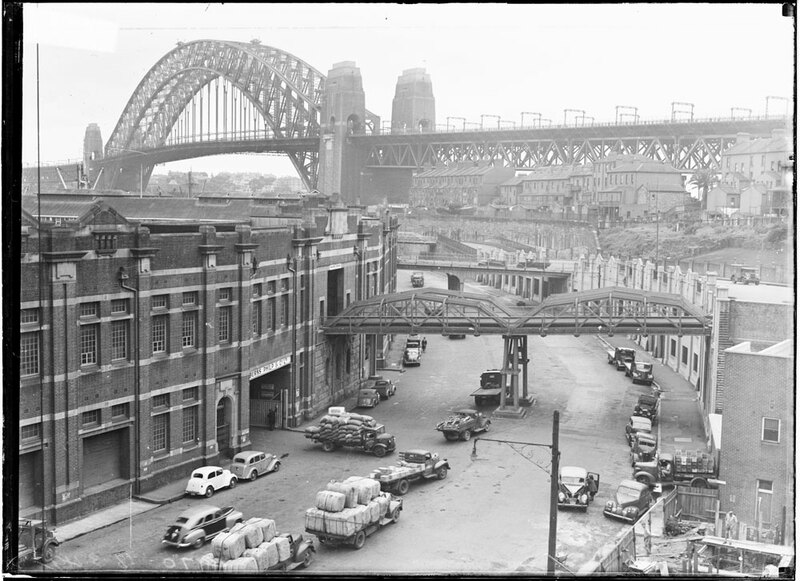 The area was home to a myriad of finger wharves, shipyards, factories and warehouses and the thousands of people who worked there lived in nearby The Rocks and Millers Point, often in crowded and insanitary slums. 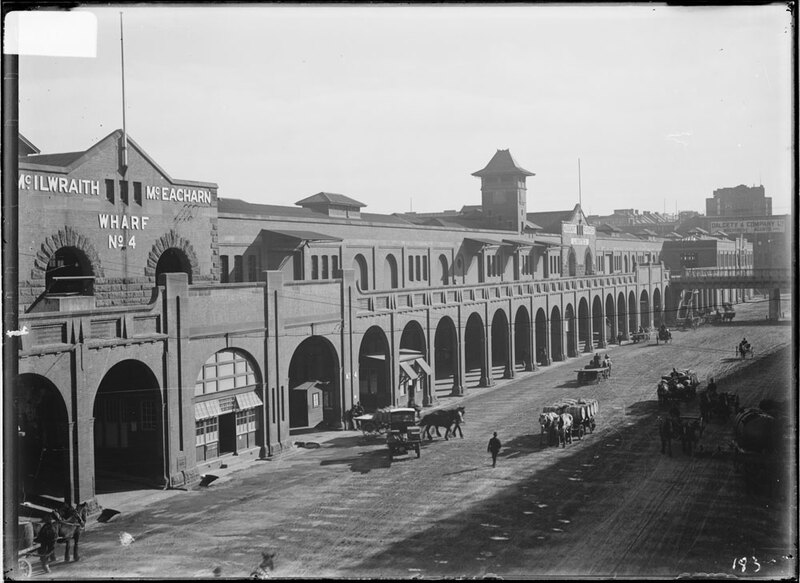 Eventually the warehouses and railways yards gave way to a modern retail and entertainment precinct, a Darling Harbour that would be unrecoganisable to the Sydneysiders of 100 years ago. 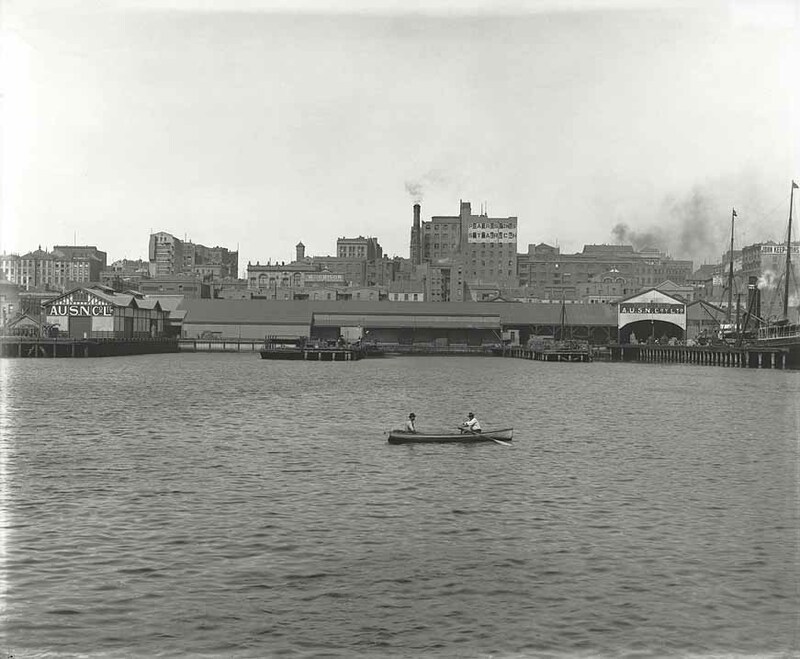 Darling Harbour was known to the original inhabitants of the Sydney area, the Cadigal people, as Tumbalong (the southern part) and Koodgi (the northern point). The First Fleeters called the area Long Cove (a reference to the length of the bay) and by 1804, it was known as Cockle Bay, after the large amounts of shell middens in the area. 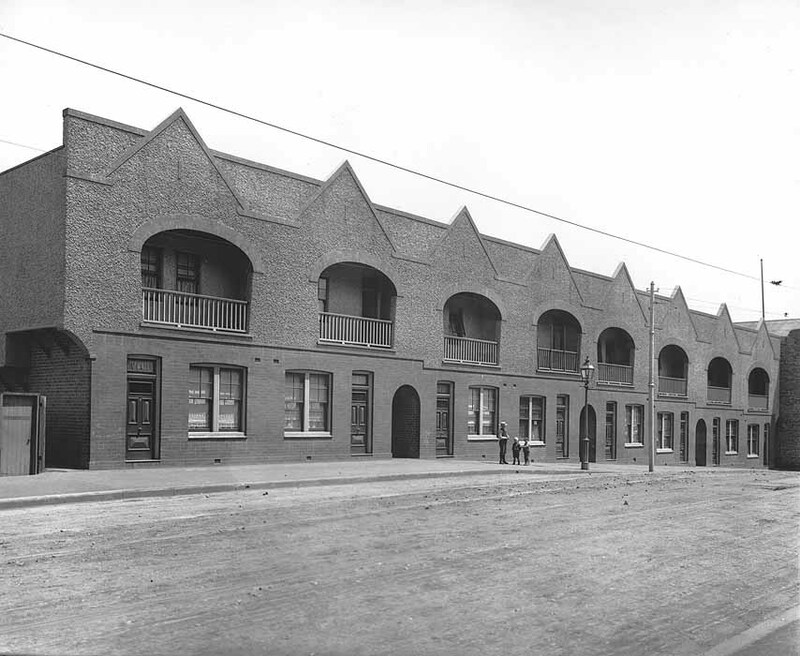 At this time, there were only 18 houses in Cockle Bay while the rest of Sydney had more than 500 homes. 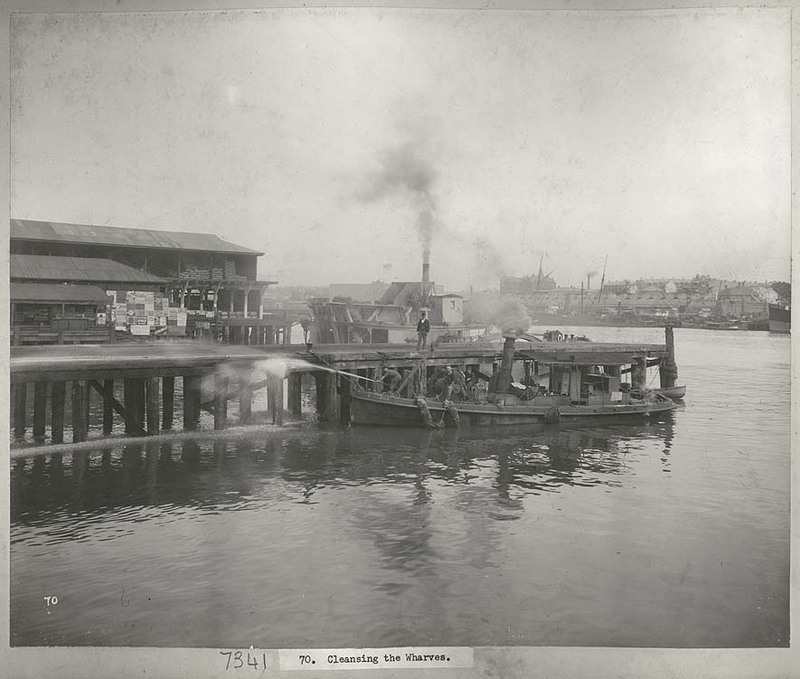 In 1811 Governor Macquarie commissioned Market Wharf, built on the site of the present-day aquarium. 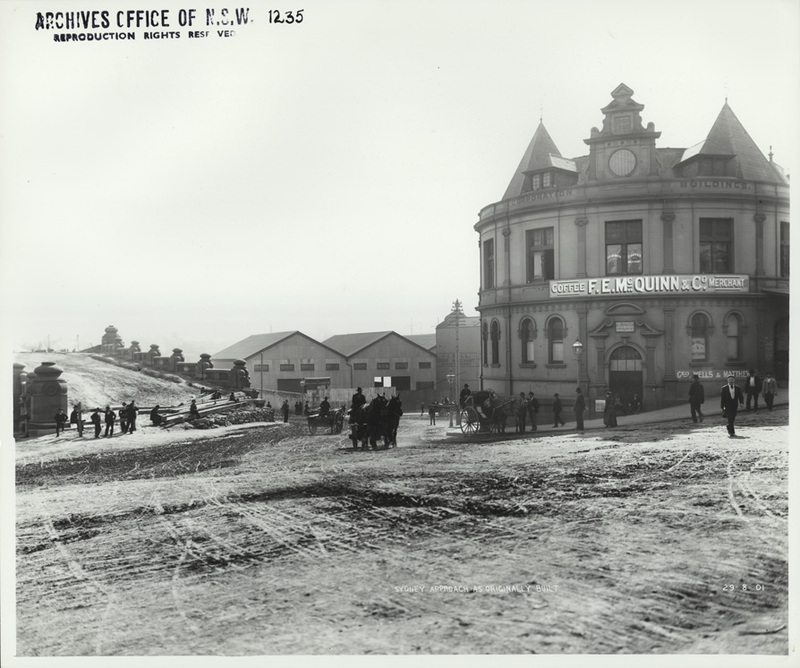 The wharf became a bustling centre for produce to be unloaded and taken straight to the town markets that operated on the site of the present-day Queen Victoria Building. In 1826 Governor Darling renamed the area after himself. The power of steam engines arrived in the Colony in 1815 and a number of flour mills used this new technology. 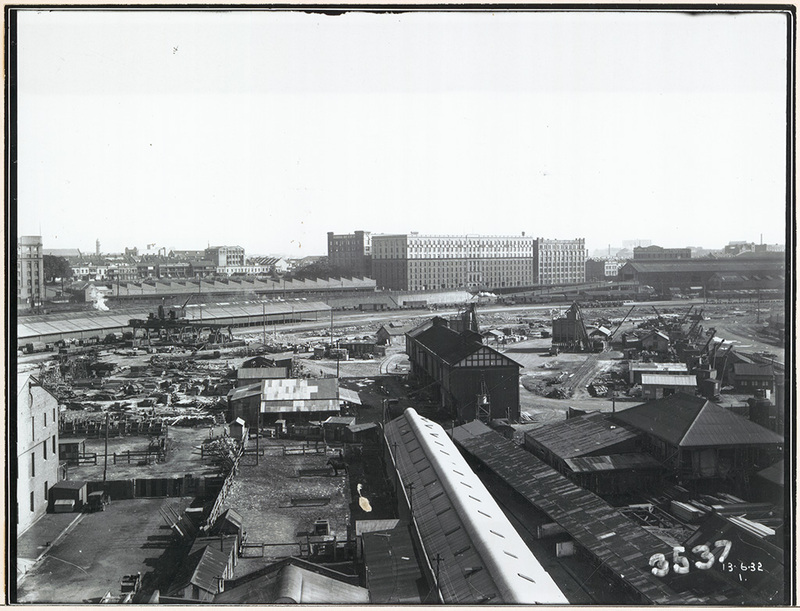 This brought an increased demand for engineering workshops and Darling Harbour became home to shipbuilding yards, textile industries, galvinising works, gas works, power stations, wool stores and frozen food companies over the decades. When the first railway opened in Sydney in 1855 it included a single line to Darling Harbour. 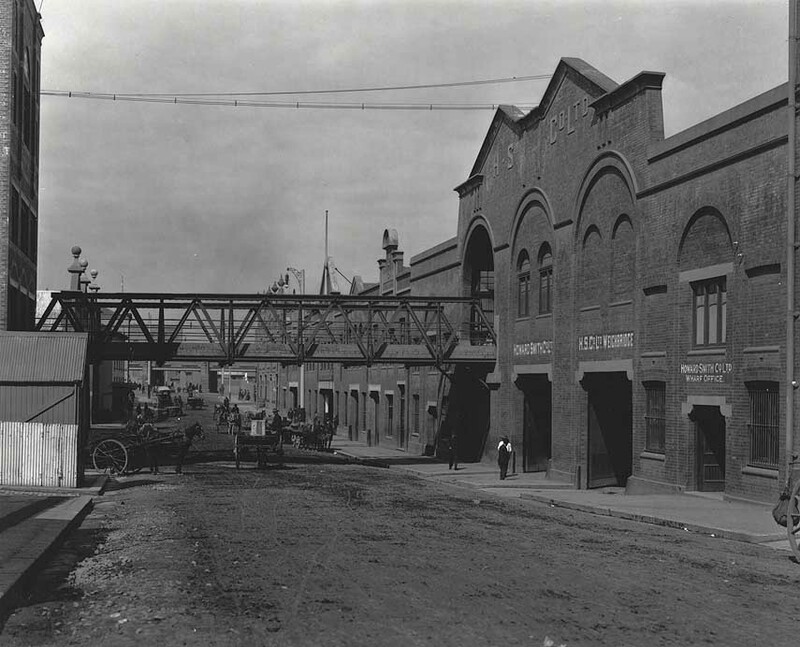 The railway yard was situated at the Ultimo/Pyrmont end of the Harbour. 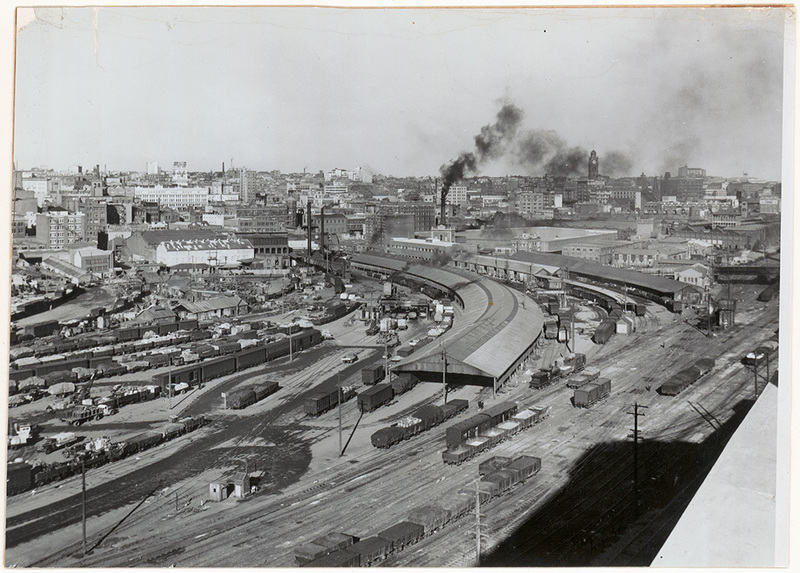 By 1874 the railway goods yard was extended on reclaimed land and by 1891 all outwards goods traffic was being dispatched from Darling Harbour. By the 1960s the Goods Yard encompassed 56 acres (22 hectares), including 50km of track transporting 13,500 trains a year. The last goods train departed Darling Harbour in 1984. 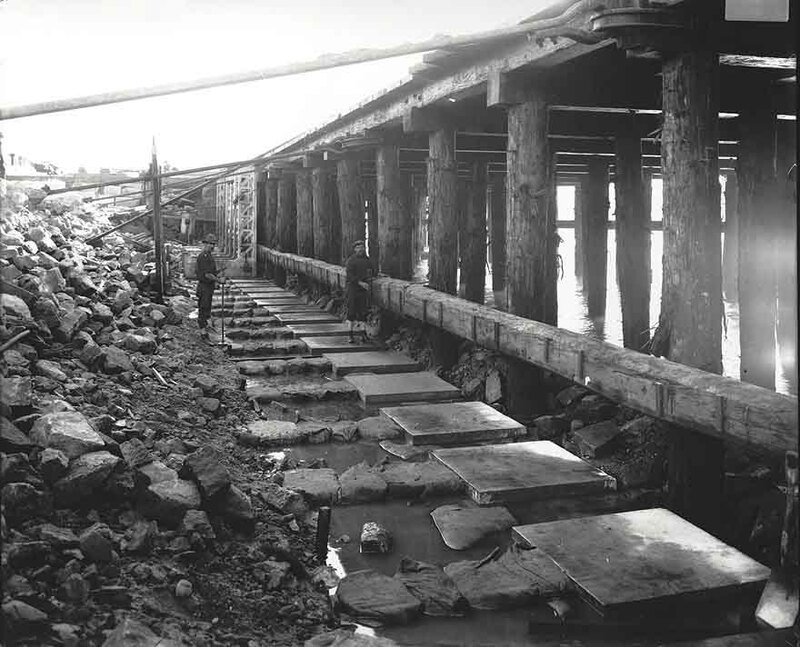 In 1857 the first Pyrmont Bridge was built as a private enterprise. The bridge connected the burgeoning western suburbs with the City. It was a toll bridge and charged 2 pence for pedestrians and 9 pence for carriages It was purchased by the Government in 1884 for £49,600. 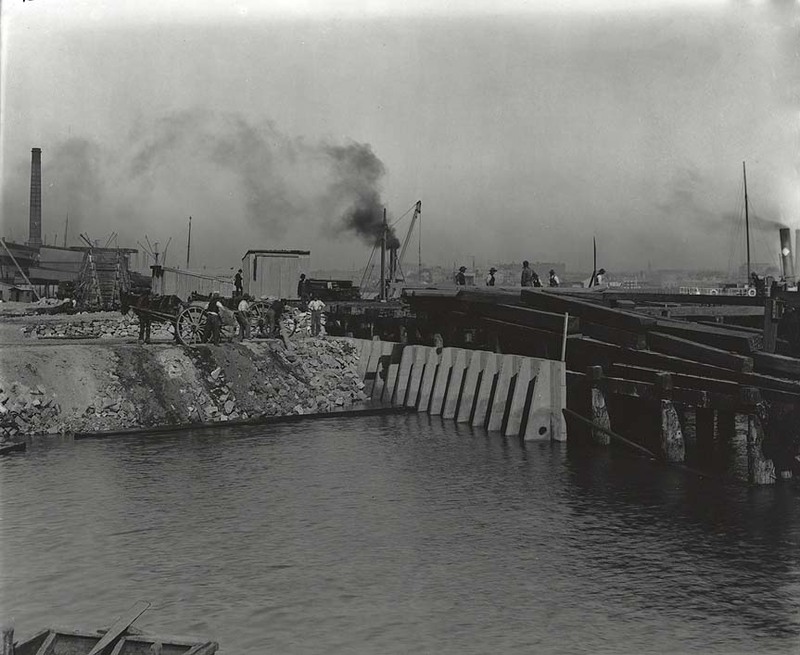 Work on a replacement bridge began in September 1899 and the new bridge opened on 28 June 1902. 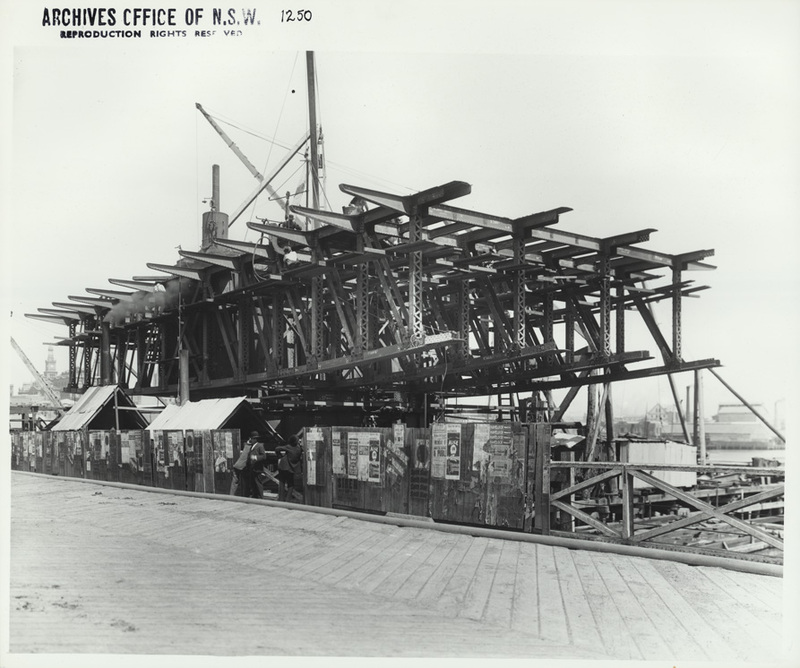 It was a steel bridge with a electrically operated swing span section that was powered by the Ultimo Powerhouse. 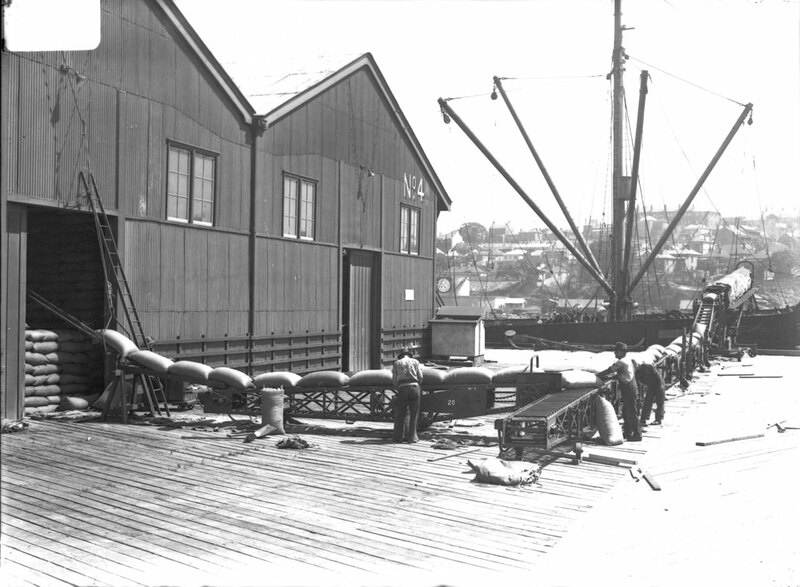 The swingspan allowed access for tall vessels to the inner harbour area. On 7 June 1981 the bridge was closed to all traffic and reopened in 1988 as a pedestrian bridge. 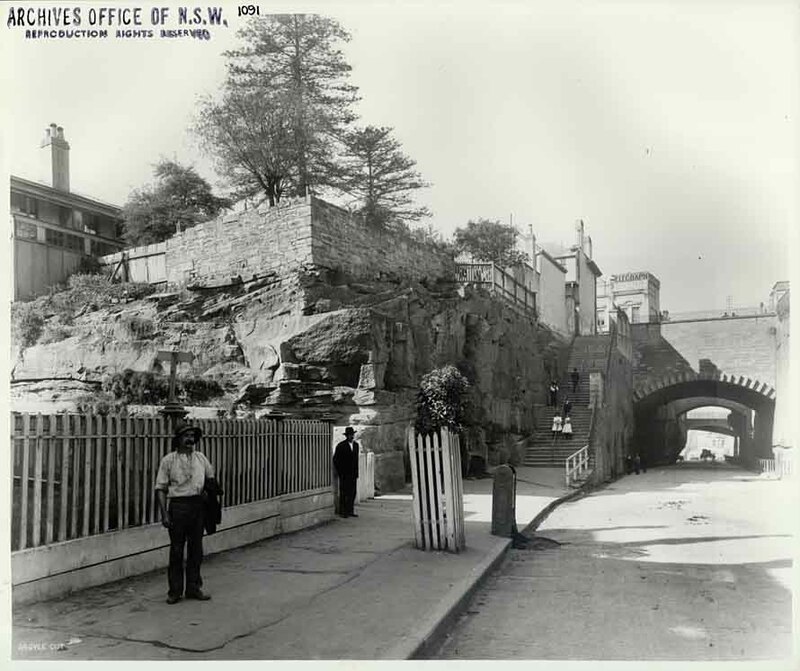 The Argyle Cut was started in the 1830s and finished in 1859. 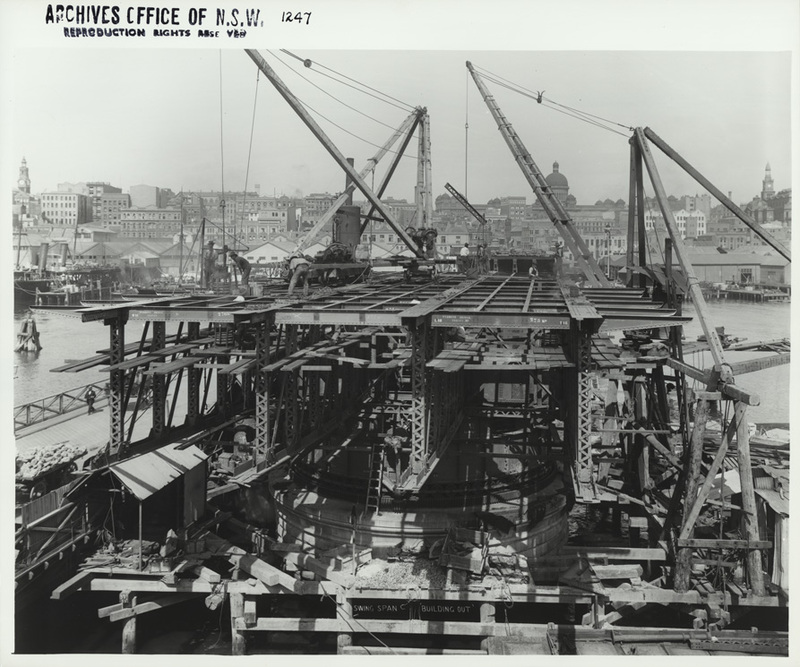 It was created to provide a direct transport link between Sydney Cove and Darling Harbour and it remained an important transport link until Hickson Road was finished in 1923. Arthur Paine, a carter who worked in the wharf area, was the first person diagnosed with the plague on 19 January 1900. 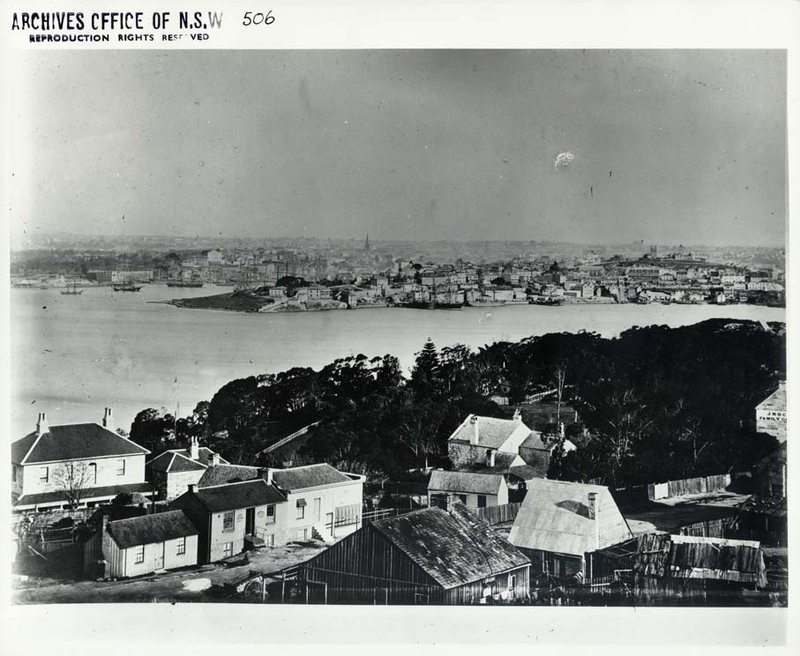 By March, with the number of confirmed plague cases increasing, the NSW Government and the Sydney Council began a quarantine and cleansing operation in The Rocks, Millers Point and down to Darling Harbour (as well as certain areas in Woolloomooloo, Paddington, Redfern and Manly). 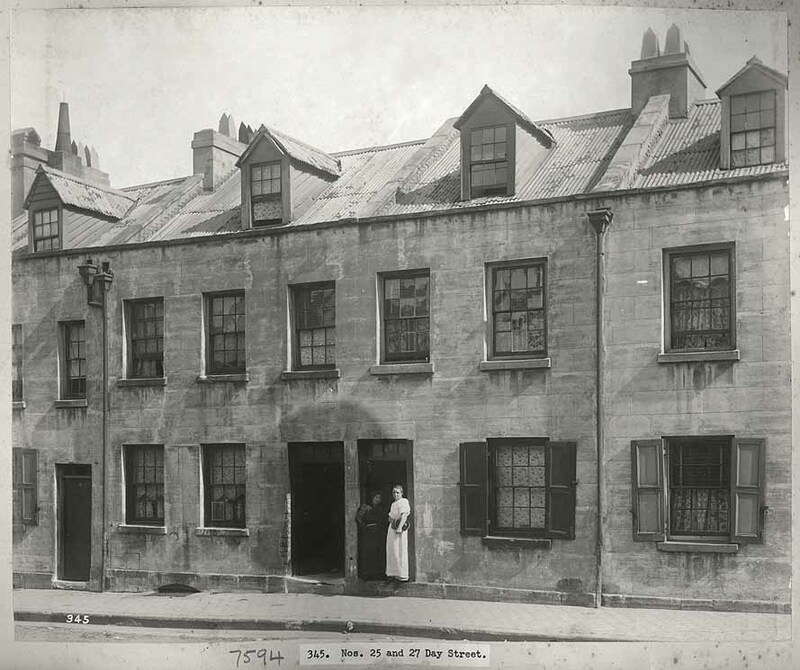 From 24 March to 17 July 1900, local residents were employed to cleanse, disinfect and fumigate the quarantined zone while rat catchers caught over 44,000 rats. The bubonic plague was epidemic from 19 January to 9 August 1900. While 303 people were stricken with the plague and 103 people died, only 3 of the dead lived in The Rocks. See Purging Pestilence – Plague! for images of the cleansing operation. In response to the plague the NSW Government set in motion plans to resume almost the entire headland from Circular Quay to Darling Harbour. 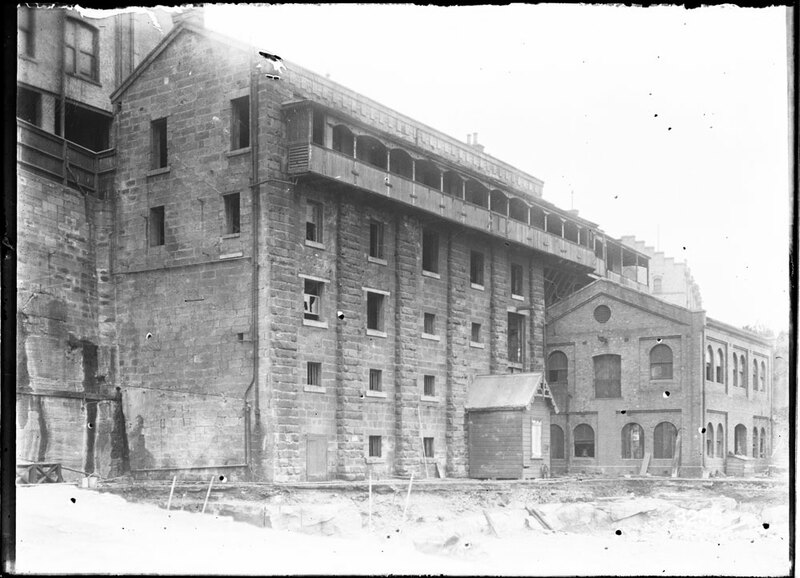 The Darling Harbour Resumption Advisory Board was established to oversee the resumptions, which included houses, wharves, factories, mills, hotels and warehouses. 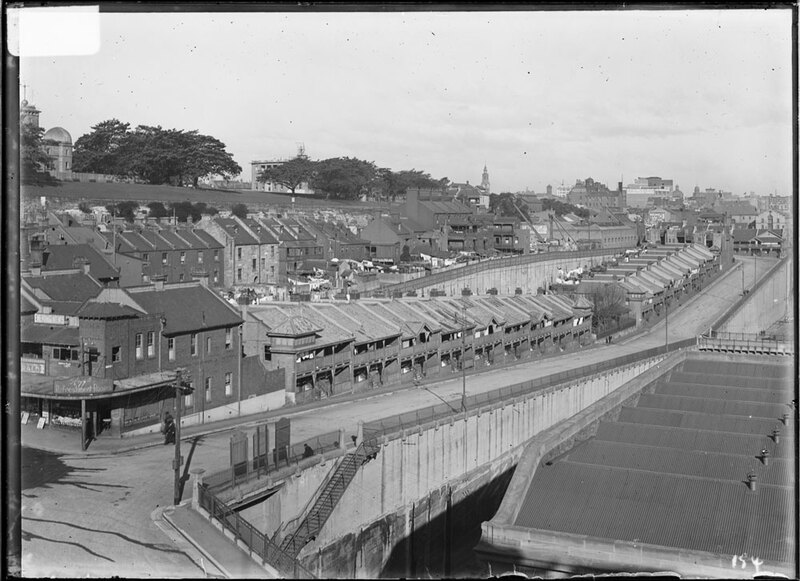 Initially 900 houses were bought in The Rocks and then in 1923 another 300 homes were resumed for the building of the Sydney Harbour Bridge. 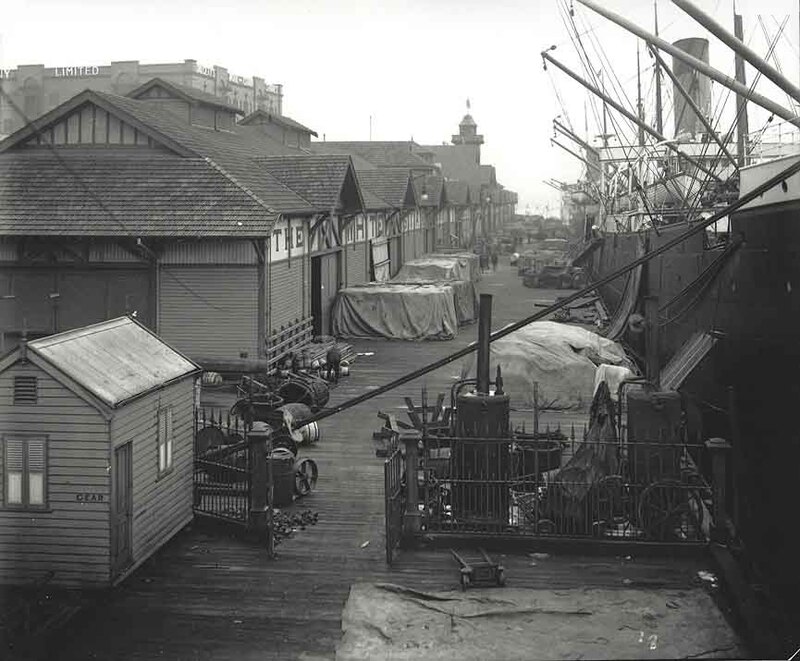 Private wharves became government property and local residents became public tenants. 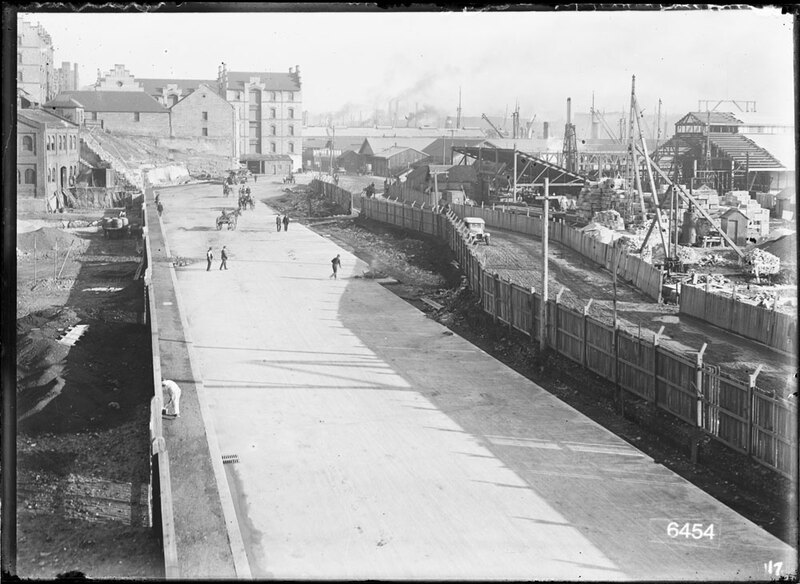 One of early tasks undertaken by the Board (taken over by the Sydney Harbour Trust, which was established in October 1900), was establishing rat proof walls and wharves, like Wharf 3 in Darling Harbour. 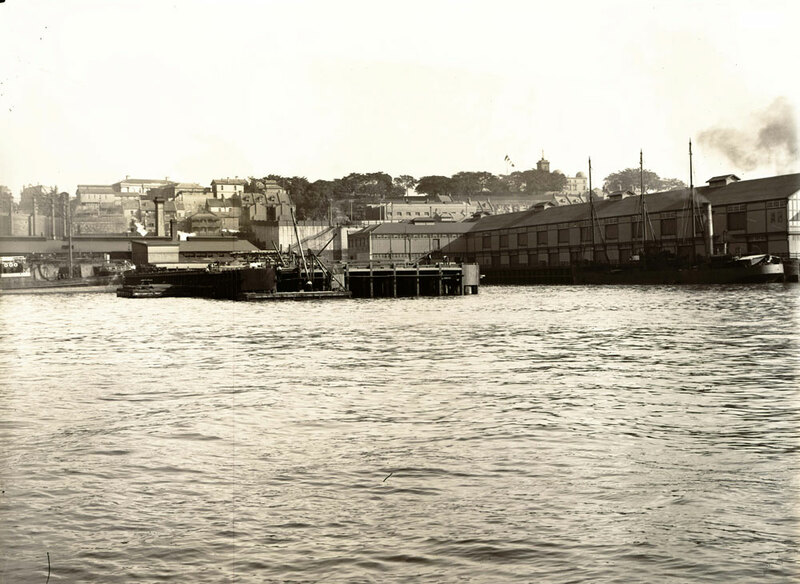 The Sydney Harbour Trust wes established for the purpose of controlling, administering and developing the port. The decline of Darling Harbour was slow. 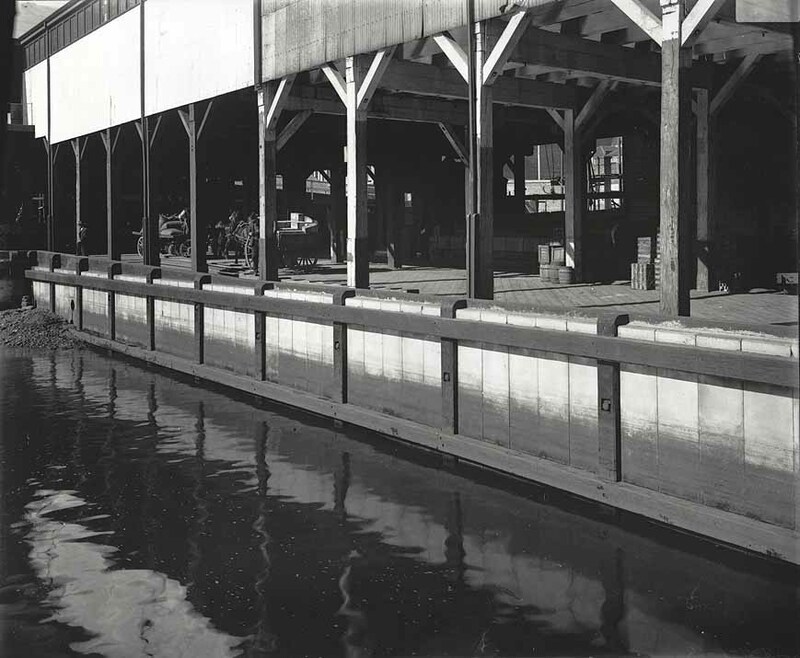 The shipbuilding industry slowed after World War II and the increased use of large container ships around the world meant that Darling Harbour, with is finger wharves was not ideally situated to cope with these changes. In the 1960s the establishment of a contained terminal at Port Botany marked the death knell for Darling Harbour as a major commercial port. 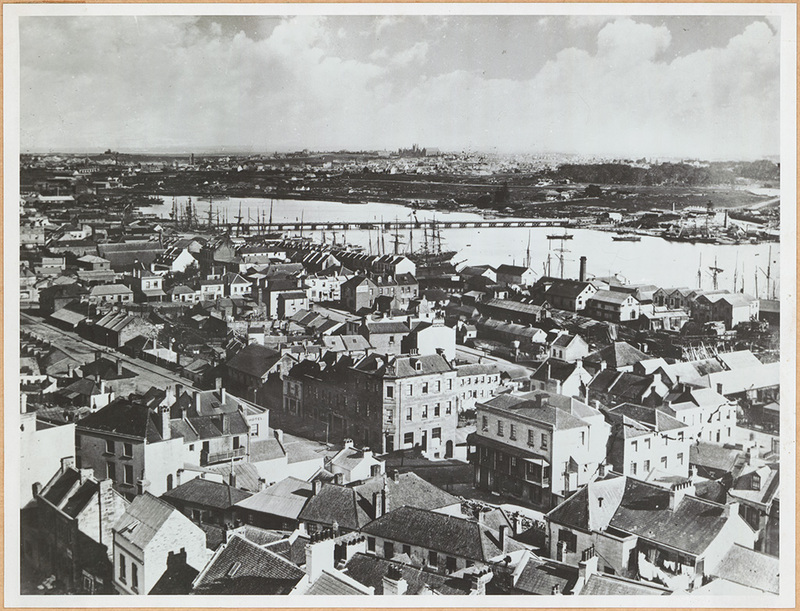 In 1984 the Darling Harbour Authority was established to plan the redevelopment of the area. Modern day Darling Harbour was “created as a gift to the people of NSW in celebration of Australia’s bicentenary in 1988.”  Darling Harbour was reborn as a tourist destination, playing host to a variety of entertainment facilities, shops, bars and restaurants. One wonders how many more transformations there will be for the Harbour area in the future?